We have performed first-principles calculations using full potential linearized augmented plane wave (FP-LAPW) method within density functional theory (DFT) framework to investigate the fundamental properties of the PbS, SrS and their alloys. The ground state properties such as lattice constant, bulk modulus and elastic constants are in good agreement with numerous experimental and theoretical data. The thermal effect on some macroscopic properties was investigated using the quasi-harmonic Debye model. 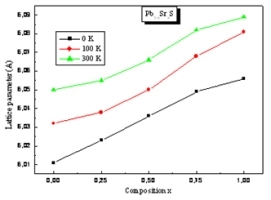 There is a good agreement between our results and the available experimental data for the binary compounds which may be a support for the results of the ternary alloys reported here for the first time.